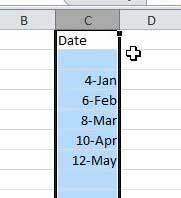 Re: Converting to Date Format in Excel Selected the column and Entered the formula you indicated =DATE(LEFT(A1,4),RIGHT(A1,2),1), but got #VALUE! in the column header row and the rest of the numbers in the column didn't change. I'm assuming that, due to your regional settings, 17/09/2010 isn't recognised as a date and 9/3/2007 is recognised as March 9th, while you want September 3rd.